"Merkel and the others from the Council only talk, while we act". 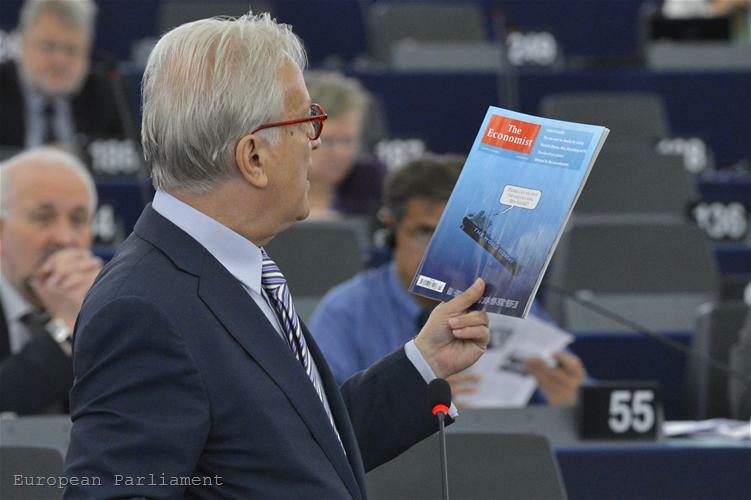 This is how the leader of the group of the socialists and democrats in the European Parliament, Hannes Swoboda, started his statement after the adoption of the Commission proposal on the so called "two-pack" in Strasbourg on June 13. 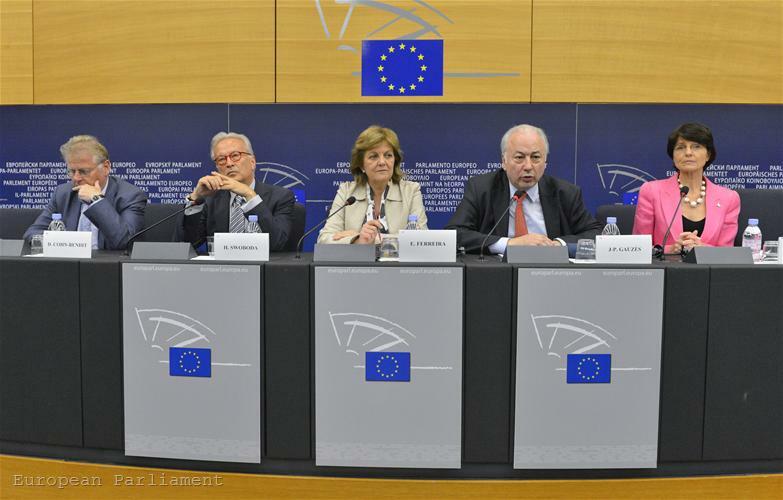 The two-pack is a complement to the already enforced in December six-pack for reform of the economic governance of the EU. The second package of the economic governance consists of two main parts - one deals entirely with the eurozone countries with financial troubles, and the other - with the budget discipline of the economic and monetary union. 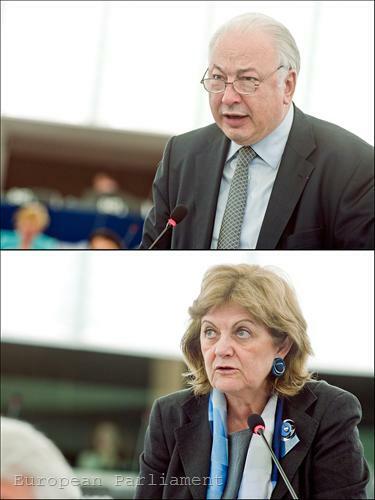 In the texts the parliament voted on the reports of two MEPs - Elisa Ferreira (S&D, Portugal) and Jean-Paul Gauzès (EPP, France) - the parliament decided to include the very controversial at European level Debt Redemption Fund. In his statement after the voting of the texts, the Austrian MEP also said that the parliament proposed a banking union back two years ago but the idea was rejected by the same people who were gathering for another summit on June 28-29 to draw the future of the EU. 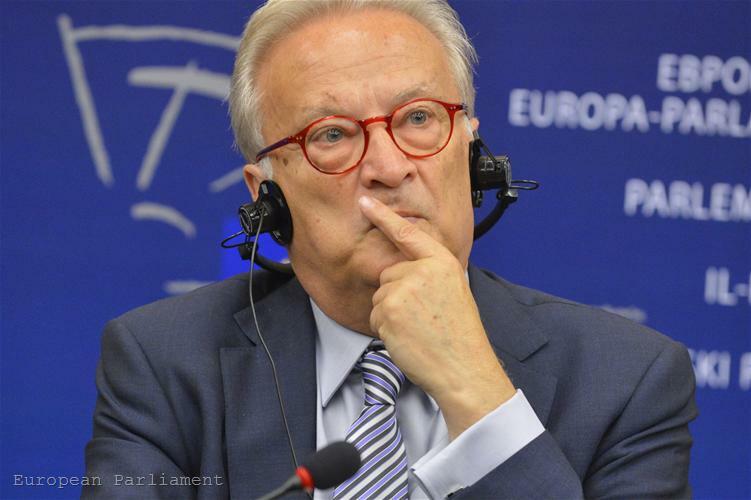 To an euinside question whether the EP was opening another military front with the Council (after Schengen), the MEP said that this was not about a fight. "The problem is that the Council to a large extent is blocked by those who do not want to move forward. Here we had differences but we produced a solution. It is disappointing how many times we are meeting and delivering and how many times they meet and produce nothing. Mrs Merkel is talking about a political union but we don't need talking - we need actions. The Council is failing. With this proposal we at least force them to say something. 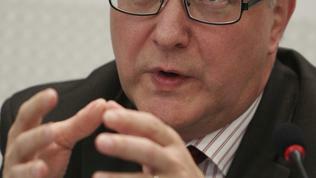 I don't believe that everything will go through but at least we force the Council to say firmly yes or no", Mr Swoboda added. 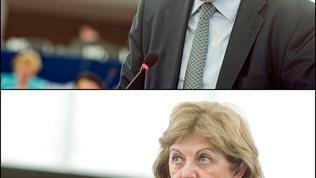 In fact, the bellicose rhetoric between Parliament and Council, aside from an indication of the increased realised role of the European Parliament, especially under the leadership of the ambitious and aggressive Germans socialist Martin Schulz, but it is also a symptom of the big stake - the future of the euro and therefore the entire European Union. As it has already become the tradition in the peak of another series of the eurozone crisis and on the eve of a key European Council, pressure is growing because of high expectations. But this time it seems that the expectations could be met. 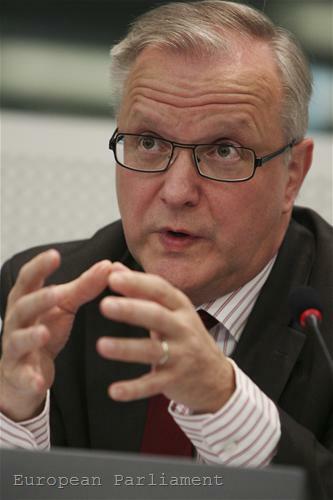 Before voting of the second package, Olli Rehn, EU monetary affairs commissioner, said before the MEPs that at the summit in end-June the "next phase of deepening of integration" will be discussed. He explicitly mentioned the growth pact (which is reported by unofficial sources that will be a separate document but it is still not clear whether it will be a declaration or a separate treaty, as was with the fiscal compact), financial and fiscal union. 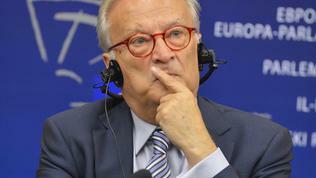 "So, we are yet again witnessing a potentially defining moment of Europe's deepening integration. 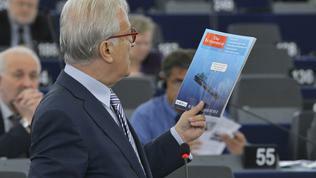 This Commission and this EP have a unique responsibility to prove that the community method will be in the centre of the next chapter of the making of Europe", said Olli Rehn with unusually elevated wording and tone, otherwise always concise and straightforward. 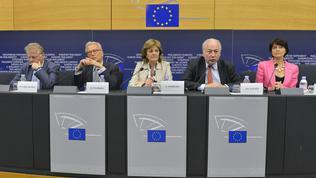 The EU commissioner underlined that the adoption of the two-pack was of major importance for the application of the fiscal compact, because if it was to be ratified by the minimum required number of eurozone member states (12) and entered into force before the second package of the economic governance, a legal vacuum would be formed. "No legal acrobatics will enable us to hide the fact that we have failed to live up to our political responsibilities", Olli Rehn warned and recalled that as a former MEP he was fully aware and deeply respected the democratic scrutiny. "I think that after almost 7 months for discussion this should be now the moment to move further from discussion to negotiation and then to decision. Our joint interest is not to get institutionally overtaken by yet another intergovernmental agreement". This remark of Olli Rehn, which refers to the fiscal compact (as it is an intergovernmental agreement, fiercely criticised because of scorning the community method), evoked vehement applause in the plenary. The approved by the parliament texts introduce some interesting changes, which will hardly respond to Olli Rehn's calls for fast adoption. One of them, voted by Parliament, changes fundamentally the approach toward countries with financial problems because it introduced a differentiated approach. For instance, in the Commission proposal it is stipulated that a eurozone member state will be put under enhanced surveillance when it is experiencing - or at risk of experiencing - severe financial disturbance in order to prevent contagion. This surveillance, according to the Commission, has to involve a "broader" access to information for closer surveillance of the economic, fiscal and financial situation. The same has to apply for countries that had requested precautionary assistance from the European Financial Stability Facility, the European Stability Mechanism, the IMF or another international financial institutions. But the parliament demands the enhanced surveillance to be "proportionate to the seriousness of the problems and should be graduated accordingly". Besides, MEPs insist the data from such surveillance to be reported before the relevant committees of the European Parliament as well, not only before the Economic and Financial Committee, as the proposal of the Commission envisages. There is a significant change of the approach of the parliament toward the right of the member states to express their views if put under enhanced surveillance. In the Commission proposal it is said that after a decision is taken to put a country with significant financial difficulties under enhanced surveillance, it will receive the right to express its views, while the Commission will decide every 6 months whether the surveillance to continue. The formulation of the parliament, however, is quite different. It demands the Commission not only to make decision to put a eurozone member under enhanced surveillance but to make this decision after taking into account the warnings of the European Systemic Risk Board, the reports of the European Parliament and the Council under the European semester. The parliament gives a chance the decision for enhanced surveillance of a member state to be rejected within 10 days by a qualified majority in the Council. The right of a country to express its views is kept in this formulation, as well as that of the Commission to decide every 6 months whether to prolong the procedure, as was voted in the economic committee in Parliament in February. The experience with Hungary has obviously significantly influenced the European Parliament because it proposes to be deleted the text in the Commission proposal, envisaging a member state with an adjustment programme, which does not apply it, to be punished with suspending payments or EU funds. Hungary was punished with precisely such a measure for non-compliance with the recommendations under the excessive deficit programme - a decision which was later abolished after Budapest managed to put its public finances back on track. But the parliament is against such a type of punishment, arguing this would put a country with troubles into even deeper spiral of economic and financial woes. The third proposal to add a text by the European Parliament is the member states to commit to make their budgets balanced or with a surplus in the mid-term, which is an essential part of the fiscal compact. The clarification "general government" in this text is of essence for countries like Spain, which has good central government fiscal policy but has difficulties to consolidate the budgets of the autonomous regions. It does not matter how will you call them - debt redemption fund, eurobonds, stability bonds, mutualisation of debt - the parliament wants it. Aiming to increase the pressure over the Council, MEPs decided to add brand new texts, related to the idea of the German experts who advise the government in Berlin, to create a debt redemption fund. The parliament, however, is aware that if it wants too much it might get nothing, so it proposes "a roadmap towards euro area common sovereign debt instruments including the establishment of an enhanced economic policy coordination framework". A certain form of common debt sharing was mentioned during the quadripartite summit between Germany, France, Spain and Italy in Rome last week but Germany remained adamant in its reluctance to share others' debt without this be accompanied by a more centralised governance of the eurozone to ensure that this outburst of "solidarity" would not prove in fact the last hole because of which the eurozone will finally sink.